Extremely heavy rain has recently fallen over Florida and the Global Precipitation Measurement or GPM mission core satellite looked at that some of that rainfall on June 7. Rainfall records were broken on that date as the GPM satellite passed overhead from space. 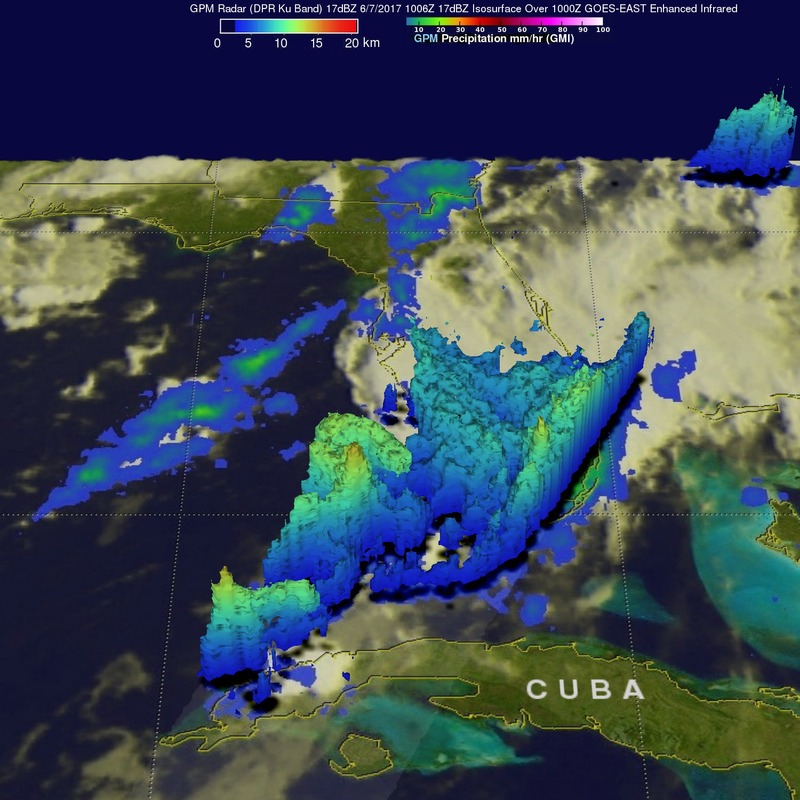 On June 7, GPM found rain falling at a rate of over 7.5 inches (190.5 mm) in one powerful storm in the Gulf of Mexico west of the Florida Keys where several thunderstorm tops reached heights of 9.3 miles (15 km). The most powerful storms were found to have tops that were reaching above 9.5 miles (15.37 km). Over 19 inches (482 mm) of rain had fallen in southeastern Florida during the past seven days beginning June 1. Record rainfall has been reported in Fort Lauderdale and West Palm. This extreme rainfall has led to flooding and flight cancellations. The GPM core observatory satellite flew above southern Florida on Wednesday June 7, 2017 at 6:06 a.m. EDT (1006 UTC). Data collected by GPM’s Microwave Imager (GMI) and Dual-Frequency Precipitation Radar (DPR) instruments revealed the intensity of rainfall within powerful storms that were drenching southern Florida. GPM’s DPR measured rain falling at a rate of over 7.5 inches (190.5 mm) in one powerful storm in the Gulf of Mexico west of the Florida Keys. GPM is a joint mission between NASA and the Japanese space agency JAXA. A 3-D view of the vertical structure in these extraordinary storms was developed from GPM Radar (DPR Ku Band) data. Those data showed that several thunderstorm tops were reaching altitudes of 9.3 miles (15 km). The most powerful storms were found to have tops that were reaching above 9.5 miles (15.37 km). A few extremely heavy downpours were measured returning radar reflectivity values of almost 61 dBZ to the GPM satellite. On June 7, GPM found rain falling at a rate of over 7.5 inches (190.5 mm) in one powerful storm in the Gulf of Mexico west of the Florida Keys. Those data showed that several thunderstorm tops were reaching altitudes of 9.3 miles (15 km). The most powerful storms were found to have tops that were reaching above 9.5 miles (15.37 km). A daily rainfall record was broken in Fort Lauderdale, Florida on June 7 when the National Weather Service (NWS) recorded 4.78 inches of rain. On that same day, NWS reported a record rainfall of 3.78 inches in Naples, Florida. The National Weather Service in Miami, Florida recorded rainfall of 10.25 inches from June 1 to June 7. For more information, visit: www.weather.gov.